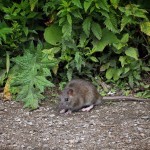 Prevention of rodent infestation is an issue that the human race has faced for over 6 centuries. In the 14th century, Europe and Asia were affected by Black Death (bubonic plague) which killed millions of people. Although such plagues are not seen today, this doesn’t mean that they can’t occur on a micro level. Although cases of bubonic plague are very rare, the fact is that rodents like mice and rats can trigger many different diseases that can affect the lives of humans and their pets. Lymphocytic choriomeningitis, Lassa fever, Wells syndrome, hantavirus, rat-bite fever, pneumonic plague, typhoid plague – these are just some of the diseases related to mice and rats. Bite marks on a cereal box is one of the most typical signs that you have a rodent problem in your home. But, there are some other signs that can help you determine whether you have unwanted guests in your home – small paw prints on the floor or other dusty areas, droppings that are small and dark, the strong musky smell in some rooms, sounds behind the walls etc. Keep in mind that mice and rats can enter through very tight holes and they can breed incredibly fast. The simplest way to keep pets safe from rodent control is to take preventive measures. Inspect your home from the outside and seal any visible openings that can serve as entry points for rodents. Of course, ensuring there is no accumulation of rubbish or food scraps in your yard or back garden will help too. When it comes to the interior, you should take special care of kitchen counters which should be kept clean all the time. If you have any open food, store it in glass or metal containers. Throw your rubbish away on a regular basis too. If you already have mice in your home, use specially designed mouse traps and sound barriers. By doing this, you can rest assured that your pet will be perfectly safe. For all your rodent infestation needs, please contact us now.